Browse or search for the Viewster app. Select the Viewster app, and then select Download. If you want to watch Viewster, select Play Now. To start the Viewster app later, go to apps, My Apps and then Viewster. 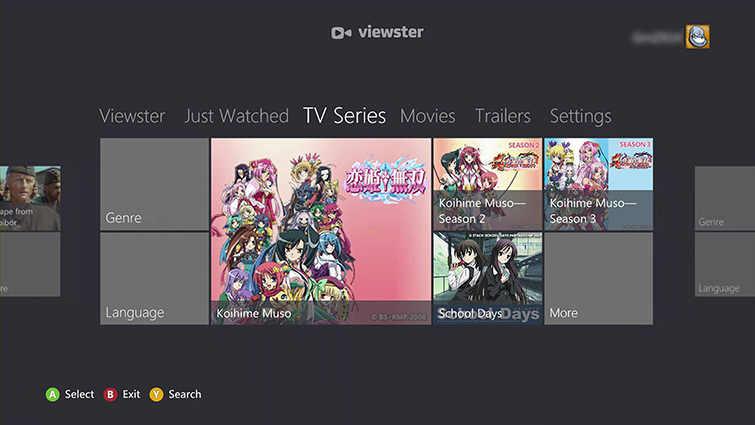 When you sign in to the app for the first time, you'll be prompted to associate your Viewster account with your Xbox 360 console. You’ll do this by signing in with your Viewster name and password. To watch TV programmes or films through Viewster, select one of the categories at the top of the screen, including Just Watched, TV Series, Movies and Trailers. You can also select one of the items showing in the centre of the screen. 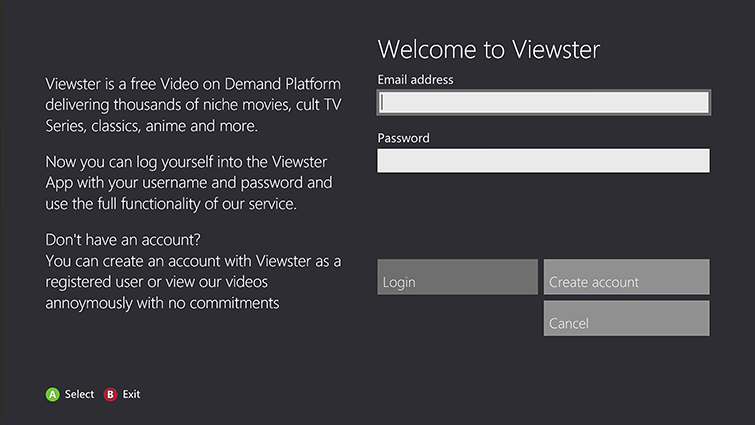 For information about how to sign out of the Viewster app, go to the Viewster support page. For help managing your Viewster account, visit the Viewster support page. 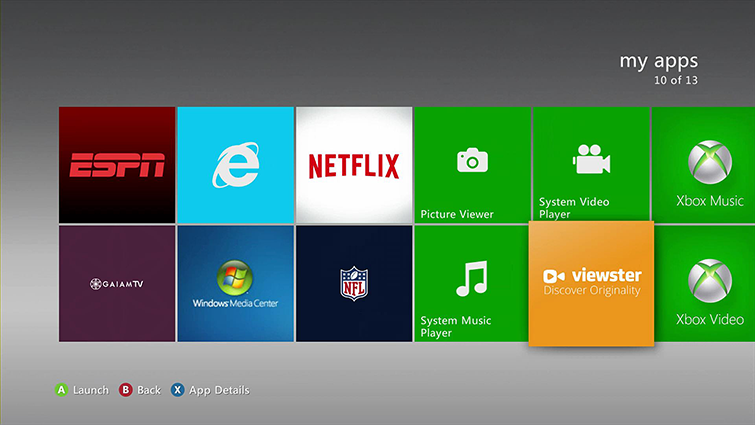 If you use Family Settings to control which films and TV programmes can be watched through Xbox Live on your console, the Viewster app will follow those settings. For example, if you use parental controls to restrict access to some kinds of TV programmes, those programmes will be marked with a “restricted” icon in the Viewster app. To play a restricted item, an adult must enter the Family Settings pass code. If the Viewster app isn't functioning smoothly on your console, you may have a connectivity problem. See Troubleshoot Xbox 360 connection to Xbox Live. Find and highlight the Viewster app. Press the Y button to access Game Options. Browse or search for the Viewster app and then select it. You may get one of the following error messages when you try to use the Viewster app. Sorry, the VIEWSTER server isn’t available right now. Please select the retry button below or try again later. For more information, go to www.xbox.com/status. Check for service alerts on the Xbox Live Status page, or see if an Xbox Live service alert appears at the top of this page. If there are any service alerts, wait until the alerts are gone and then try again. If there are no alerts, wait about a minute and then try to launch the app again. If you continue to receive this error, try deleting and reinstalling the Viewster app. Note Viewster is responsible for all issues relating to content within the Viewster app. You can contact Viewster support at viewster.freshdesk.com/support/home. If you get one of these errors, wait for about a minute. Then, try to launch the content again. To notify Viewster of the content error, contact Viewster support at viewster.freshdesk.com/support/home. Would you like to contact Support regarding the "Viewster app on Xbox 360" issue you were reading about or a different issue?